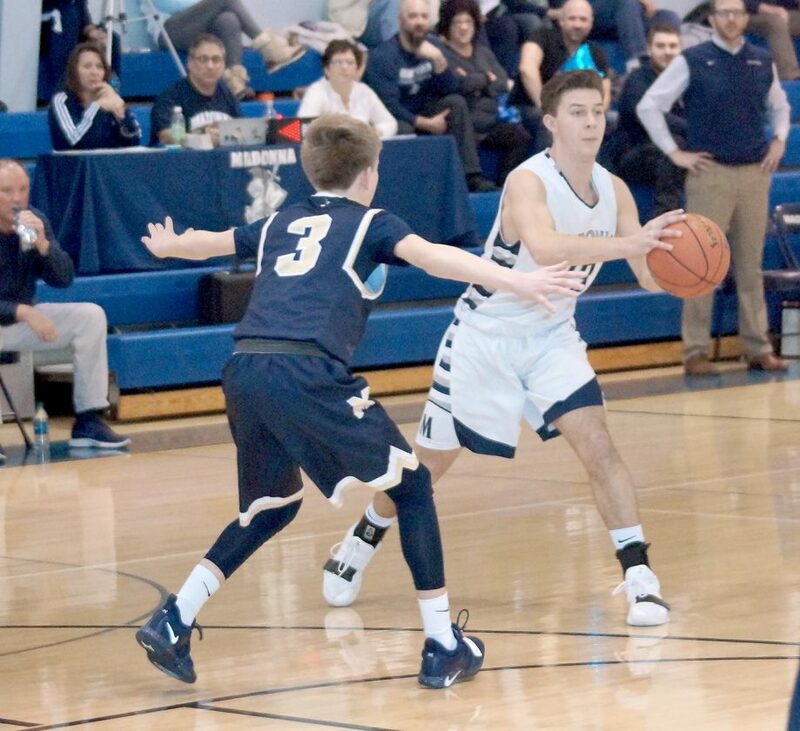 WEIRTON — Madonna took the lead midway through the second quarter and Magnolia was unable to get it back the rest of the game as the Blue Dons celebrated senior night with a handy 56-46 win inside the Dube Dome Saturday afternoon. The win snapped a five-game Madonna losing streak and gives it a record of 5-14. While they couldn’t get the lead back, the Blue Eagles, playing with three starters on the injured list and another starter hurt during the game, hung around until midway through the final eight minutes. Sophomore guard Lucky Pulice, who has been in a season long slump after averaging about 12 points a game in his freshman year, broke out in a big way with a double-double. He scored a season-high 24 points and grabbed 10 balls off the glass. The Blue Dons had a 37-27 advantage in rebounding. Veteran Magnolia coach Dave Talman substituted freely during the game after his team played a strong game against Camron Friday and is in the midst of playing six games in seven days. “It has been missed free throws and easy shots all year,” said Talman, whose club now is 5-11. “That’s what has killed us all year. The kids play hard and play good defense and we’re rebounding the ball really well. We had three starters out and lost a fourth during the game, but we do have a lot of depth. The Blue Eagles made only 4 of 10 from the free throw line but the two freshmen, Trevor Williamson and Damon Shimp, each scored nine points. Jake Gamble led the way for the Blue Eagles with 17 points and captured seven rebounds. Dominic Mazur, one of the five seniors honored before the game, backed up Pulice with eight points. The other seniors are Christian Ridgeway (four points), A. J. Mitchell (four points), Gavin Dietrich (six points) and Niko Fuscardo. “It seemed that after Lucky (Pulice) made a couple of baskets early he gained confidence,” said Blair. “It was good to see him playing with that confidence because he can be a force for us from here on out. We’re rallying the troops to make a run for the state tournament. We have the OVAC consolation games coming up next week. We play at Buckeye Local Tuesday and play here against Valley next Friday. The Blue Dons were ahead by only four when Pulice hit a driving shot to expand the lead to 47-41 with 4:06 showing on the clock. Next time down the floor, Pulice zipped a nice pass to a wide open Mitchell under the basket for an easy lay-in. That gave the Blue Dons their first double digit lead at 51-41 with 2:26 left in the game. From there, Madonna didn’t make another field goal but went to the foul line 10 times making five of them with only a Gamble layup in return. After the two OVAC consolation games next week, the Blue Dons will wrap up the regular season by hosting Clarksburg Notre Dame at the Dube Dome on Feb. 20. The Irish are 16-2 and beat the Blue Dons 77-48 back on Jan. 23. Notre Dame now is rated No. 1 in the state, according to Blair. 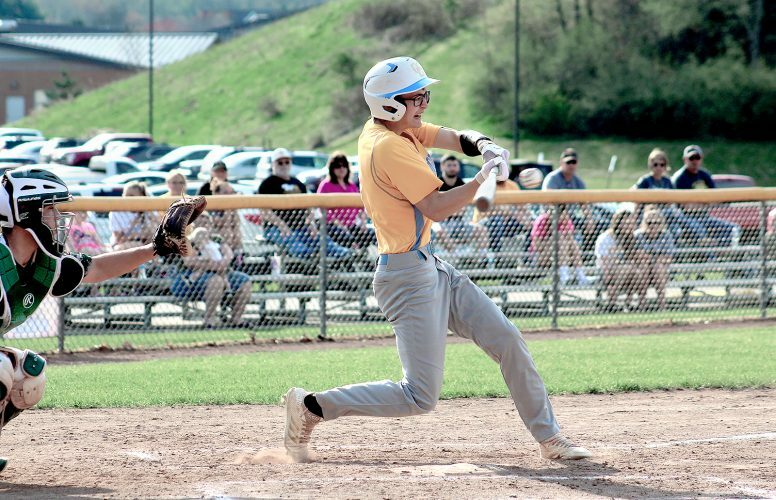 The Blue Eagles return home to play River tomorrow, Clay Battelle in a OVAC consolation game Tuesday and Catholic Central Wednesday. ¯ The Madonna reserves recorded a 10-point win over the Blue Eagles, 42-32. Tom Sessi scored 11 points and Matt Amaismeier added nine. Griffen Wells led Magnolia with 10. ¯ In addition to honoring the five Madonna seniors in the pregame, the annual Juice Man Award was presented to Sharon Higgins, who aided the Madonna coaching staff in many ways behind the scenes. MAGNOLIA (5-11): Williamson 3 0-0 9, Gamble 7 1-1 17, Scheibelhood 2 1-2 5, Miller 2 1-5 5, Stickler 0 1-2 1, Shimp 4 0-0 9. TOTALS: 18 4-10 46. 3-POINT GOALS: 6 (Williamson 3, Gamble 2, Shimp); REBOUNDS: 27 (Gamble 7); TURNOVERS: 8. MADONNA (5-14): Secrist 2 0-0 4, Sessi 0 0-0 0, Ridgeway 2 0-0 4, Mitchell 2 0-0 4, Boniti 2 1-3 6, Fuscardo 0 0-0 0, Dietrich 3 0-1 6, Pulice 8 6-9 24, Mazur 1 6-8 8. TOTALS: 20 13-21 56. 3-POINT GOALS: 3 (Pulice 2, Boniti); TURNOVERS: 8.